Looks like they dropped a truck bed straight into a wagon or sedan. Has disc brakes and a continental kit. Willing to trade for a nice boat. Looks pretty backwoods. "backwoods" built ! Turned out, that is just how Mopar built them ! I was thinking the same thing! The Sweptside being a standard truck bed cut to fit in between the fins of a wagon. Makes me wonder why they didn't just adapt the Aussie utes into an American version for a more polished look. They got some pretty sweet looking car-trucks over there that we never got. and bed would be a massive improvement over what really happened. some really good looking wagons ! Doctor DeSoto - 2018-12-26 9:26 AM A full size U.S. market Forward Look car, built with an Aussie-cued ute roof and bed would be a massive improvement over what really happened. While we're at it, give the 57-59 wagons the 1960 NY'er treatment for some really good looking wagons ! Most definitely. I agree on the wagons too, the 60-61 wagons are an absolutely stunning design. It's kind of dissapointing that we never got a 57-58 hardtop wagon. Plus they cut the fins down on the 57-58 wagon some reason, and we never got wagons with full size fins until 60. 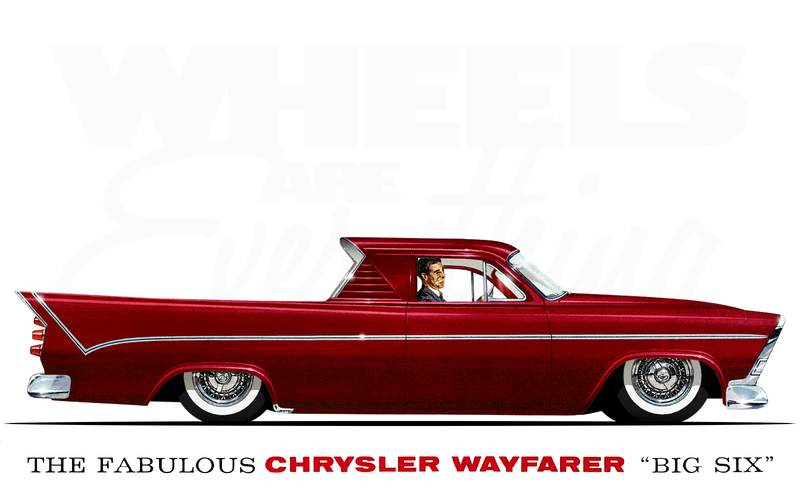 If I ever get good at welding I'll probably make my own 57-58 hartop wagon with full fins, probably a Desoto.